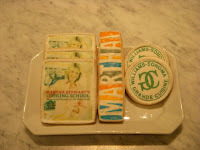 I am a huge fan of Martha Stewart. Say what you want, love her or hate her, she is an inspiration. She's a great business role model (albeit one who has served her fair share of "time"); her company has great products and books; and her magazine is one of my constant resources for recipes, research, decorating and collecting ideas. 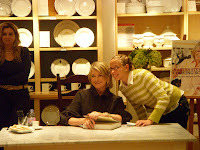 This past Friday, November 7th, she came to the Williams-Sonoma store where I work. 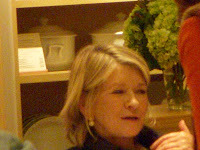 Martha has a new cookbook, Martha's Cooking School, that was just published. 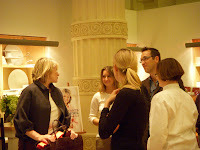 Our store was lucky to be her only Philadelphia book signing. It's rare, positively unheard of, for our store to land any celebrity cook book authors or chef's, let alone the queen bee of them all! There was a lot of planning, staffing, cooking and cleaning that happened in the weeks and days before her visit. The managers and assistant managers worked themselves to death to get everything ready for this book signing and their hard work paid off. Our store had an amazing event. We had Restaurant IXI giving out food; our resident chef, Margaret, made gallons of Martha Stewart's Tomato Soup and about a thousand chocolate chip ginger cookies. 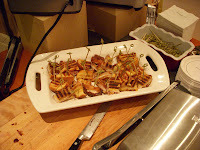 We made turkey stuffing and gravy, showcased in Calphalon chaffers. Staffers demonstrated knives and other equipment. Just about every staff person who works in our store, as well as several from other stores was on hand working. 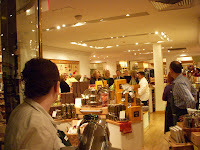 We were packed full with hundreds of customers, photographers and Williams-Sonoma corporate managers. It was like an elegant expo. I was asked to demonstrate the Breville Panini maker, and make turkey cranberry paninis for over 400 people! Mind you, it was just a taste, so I did not have to make 400 sandwiches! I think I made about 60, and cut them into small bite sized pieces. They were a hit! What was basically a "white-trash" sandwich became elevated to a whole new level! It was a slice pf whole wheat bread on one side and a slice of potato bread on the other - slathered with butter on the outside; I put Dijon mustard on the whole wheat, then a layer cheddar cheese, luncheon turkey meat, more cheese, and spread Williams-Sonoma Apple Orange Cranberry Relish on the potato bread slice; then onto the panini grill! People were losing their minds over these little sandwiches. I couldn't believe it. The soup, cookies, stuffing and offerings from Restaurant IXI were all scarfed up so fast, it was as though the customers came to our store starved and looking for their last meal. The evening's event ran smoothly and was a success. And Martha - she was so gracious. She came in at ten to five, went up to our offices, and was downstairs at 5 pm to start the book signing. In two hours, she must have signed over 500 books! At precisely 7 pm, she was finished; said a few words to the staff and remaining customers, and promptly left our store to head upstairs to Restaurant IXI for dinner. Luckily I was done making panini, so I was able to be at the end of the "receiving" line as she left the store. I felt like I was seeing the queen! Unlike the day when I saw Pat Burrell (The World Series Champion Phillies Right Fielder! ), I was able to keep my composure and say something intelligent - basically thanking her for visiting. My big moment! Actually, it was just fantastic to be a part of the whole evening's event, and to snap a few photos, and get a signed book. Not that I can now die happy, the Phillies winning the World Series and Barack Obama winning the election made that possible, but Friday night's event was a definite event high light of my culinary life.